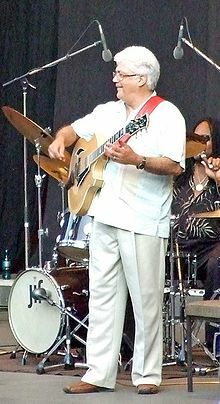 This article is dedicated to Larry Coryell who left us on February 19th 2017 at age 73. Thank you for the inspiration and the music, Sir. On composing and improvisation: "We felt that we had to build the structure and then do the freedom within the structure, and if the structure was strong enough, the freedom within the structure would give us enough freedom to do what we wanted." "I tried to change my philosophy and to make music first. But I know that very often I will fall back into 'guitaristics' and techniques, and I accept that." "It's really hard to do an imitation of a Charlie Parker solo, but by the same token, it's not that easy to do an imitation of Eric Clapton when he was on the Bluesbreakers trip." On studying Wes Montgomery's solos: "I would listen to Wes Montgomery and not have any idea how he did it. Not the technique but just the mind. Not because I wanted to play like Wes, because that would be like asking a Ford to be a Rolls Royce." "I would go out with the boys in the old days and laugh at Paul Desmond, just because I wanted to go along with my peer group, and now I really listen to him, and he can make me cry." "Jazz goes beyond music -- it's enlightenment. Enlightened to those things which cannot be seen or felt. Rather than, 'Oh man, I boogied all night, and I threw up and had a great time getting loaded." "There's a big difference between performing and creating, and I feel the really great jazz performers, even though as a sidelight they may be entertaining, feel it their duty to create." "That was what made Cream so great, they were considered a pop rock group but they were creators. When Cream came on, Eric Clapton never repeated himself, Jack Bruce never repeated himself, and Ginger Baker had to get some repetition going. But they were all creators." "You can get down there and play four-four, but if you're not cooking, you're not creating." "I think people are looking for enlightenment, not escape. And I think that enlightenment is just one degree beyond that musical escape that really gripped our musical fabric." "That was Elvin Jones' philosophy, "You go up there and play like it's the last time you're ever going to play." If there's one person in the club, he'll be up there playing up a storm." "I've just been lucky enough to be around musicians who have given me the knowledge that I've gleaned from them. It lets me know who I am, and who I'm not." On great musicians: "I think what they are projecting is the music which comes out of the cosmos and out of the earth, and they just allow themselves to be an antennae. All this music is in the earth, in the sky, and it comes through some people, their bodies, their hands, and their instruments, and what comes out is pure music." On the ego: "Needless to say you've got to have some ego just to check into a motel, but ego is a double-edged sword. You can either fill a house with it or cut yourself." "When I'm improvising I'm not conscious of anything I do, but when I'm practicing it's all mind. When I practice I'm all mind and when I'm improvising I'm all heart. I try to turn the mind off." "You have to practice to use your mind in the woodshed in order to free your mind when you're up there onstage." "My calling on this planet is to be a searcher, in search of something new. But I won't be disappointed if on the day I die I don't find it -- at least I'll be searching."